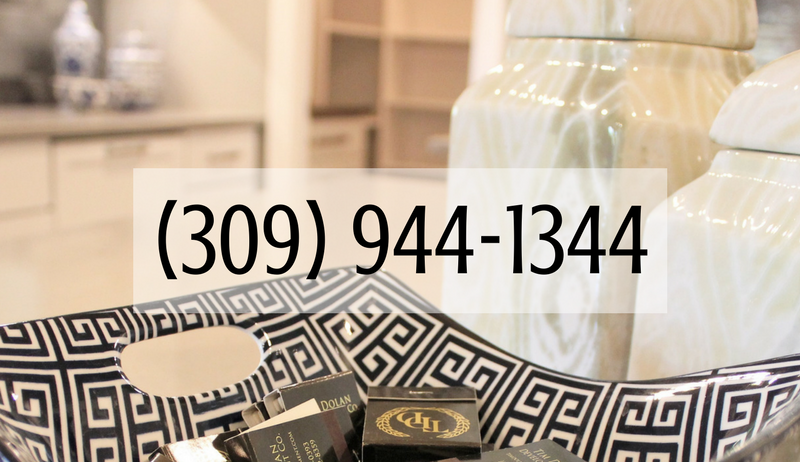 This Fall in the Quad Cities we again had the pleasure of seeing our designs and products in many of the QCBR Parade of Homes listings. 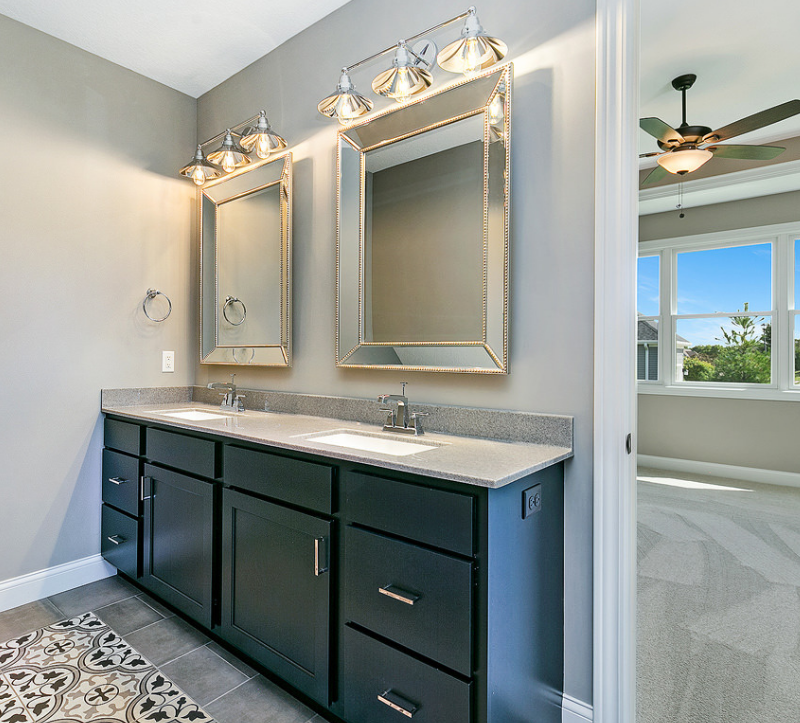 We have so many opportunities to showcase before and after remodel stories here on the blog. 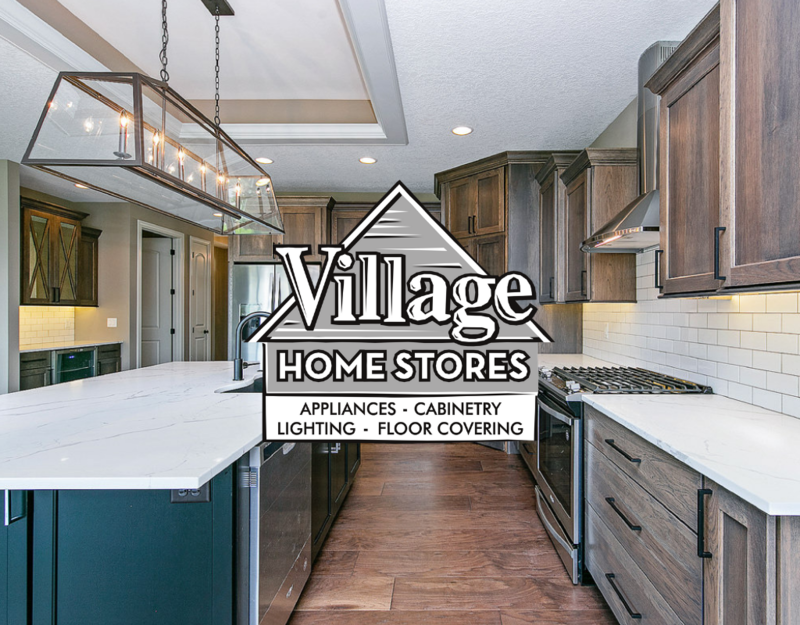 Truth is, we love any chance we can get to also remind you that we can help you if your dream kitchen is in a brand new home you are building! 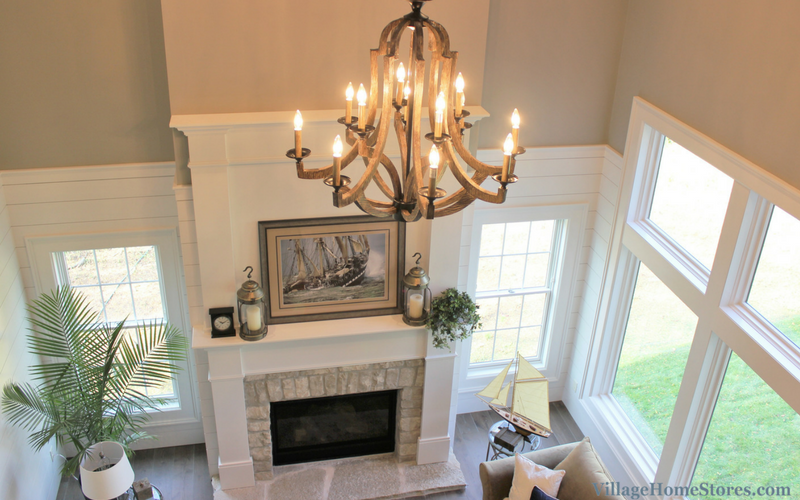 Take a look at this gorgeous example of New Traditional style in Bettendorf, IA in a home built by Tim Dolan Development. A classic selection of a white painted flat-panel doorstyle is paired with many other on-trend choices for the finished space. 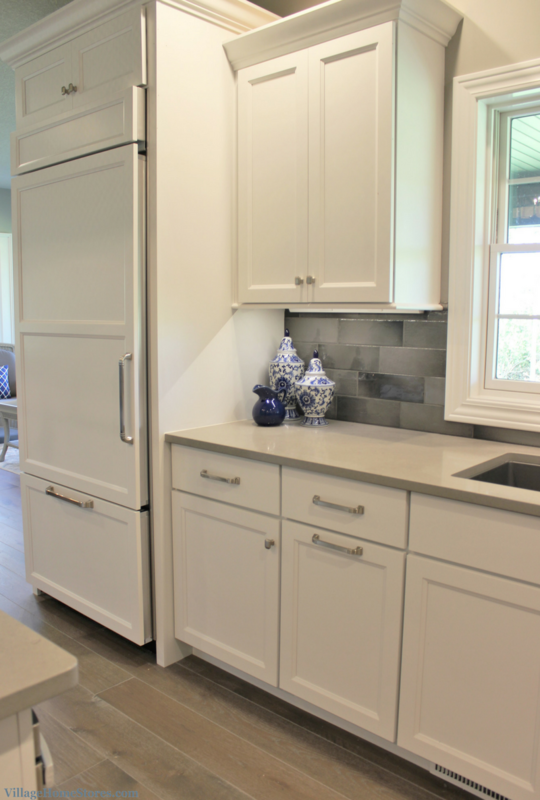 The cabinetry is from our Koch Classic line in the “Bristol” door. 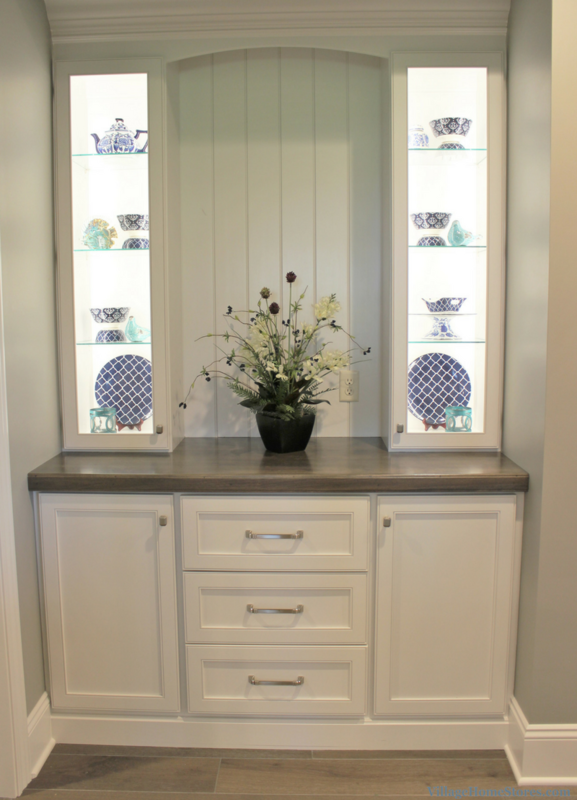 This door is a clean look with a shaker edge applied and smooth, slab-style drawer fronts. This is a “Full Overlay” style cabinet which means that the doors and drawer front span across the cabinet faceframe fully. 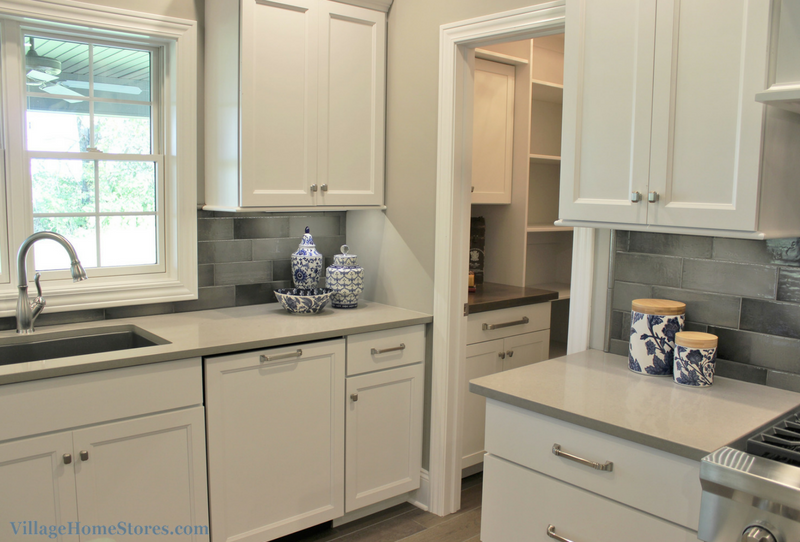 This gives a more customized look to a row of cabinetry and shows less gaps between cabinets. Another custom detail is the built-in refrigerator that has been fit with panels made specifically to fit this 36″ wide model from KitchenAid®. This bottom-mount freezer model includes a platinum interior, spill-resist glass shelves, LED lighting and a built-in icemaker. 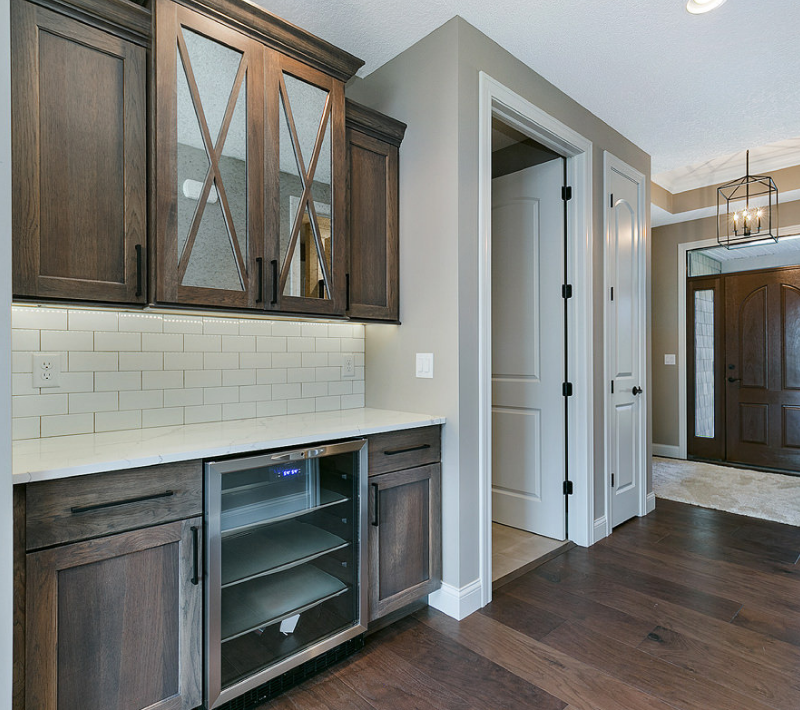 There is plenty of storage within the kitchen and access to a walk-in pantry area centrally located in the layout. 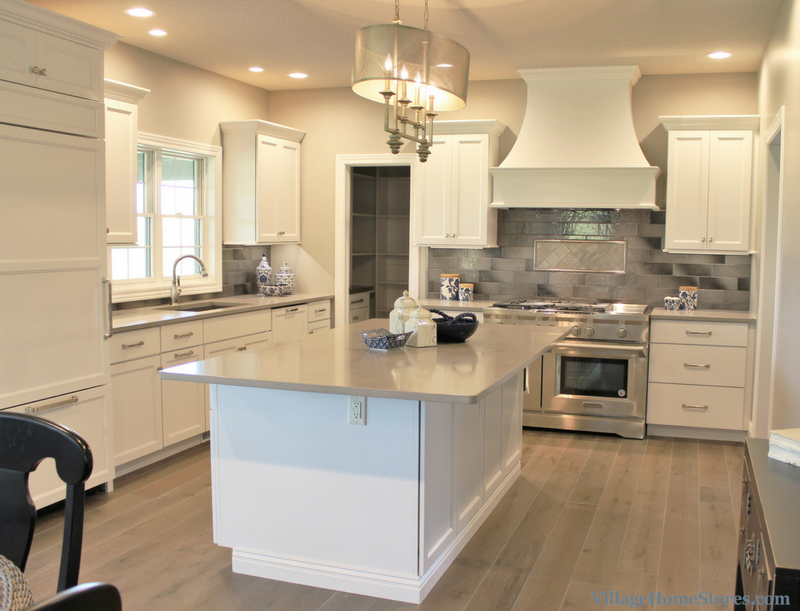 As you turn the corner you see the main focal point of the kitchen is the wood hood and large range centered on the back wall. 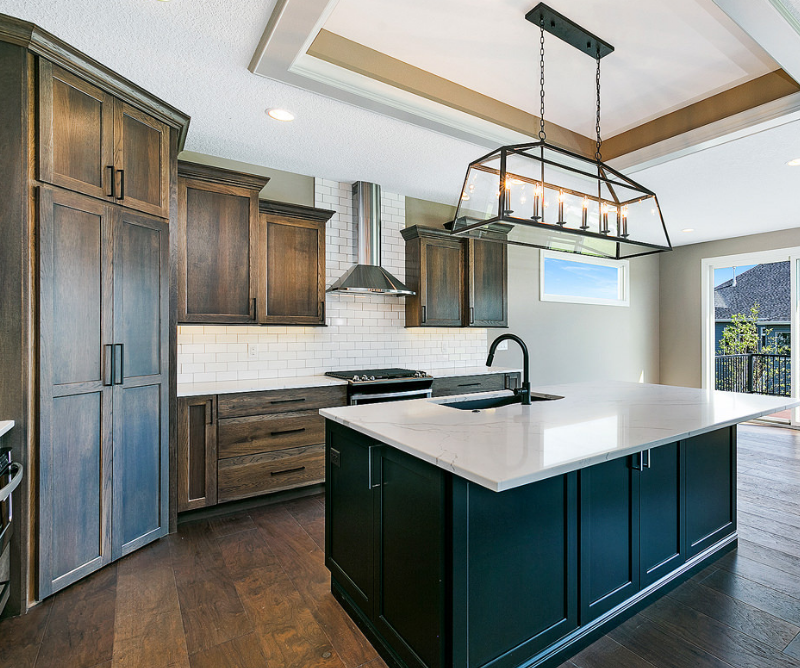 This sloping wood hood has been painted to match the kitchen cabinetry and trimmed out in the same crown and under-cabinet molding as the kitchen perimeter. A Broan® internal blower insert and assembly fit with 900 CFM’s is concealed within it. 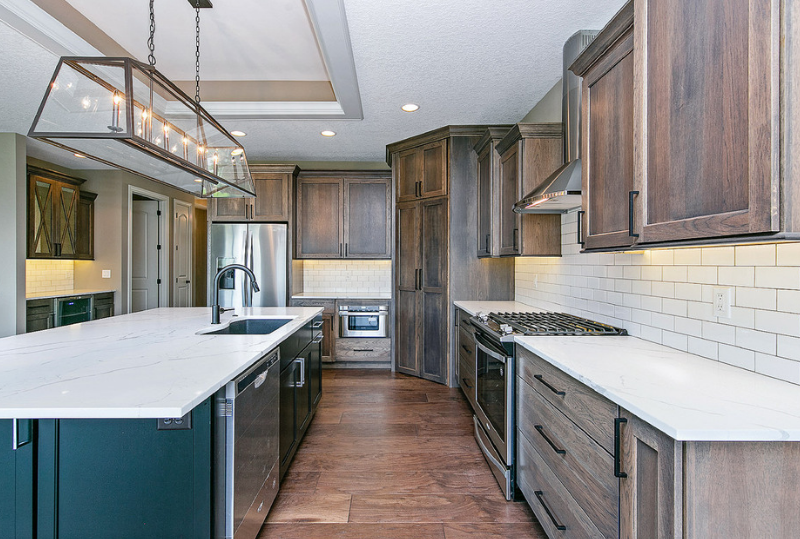 The cooking zone of this kitchen design has access to the Sharp® microwave drawer in the kitchen island as well as a 48″ gas range packed with features. This 6-burner range from KitchenAid® includes an easy-to-clean chrome electric griddle surface. 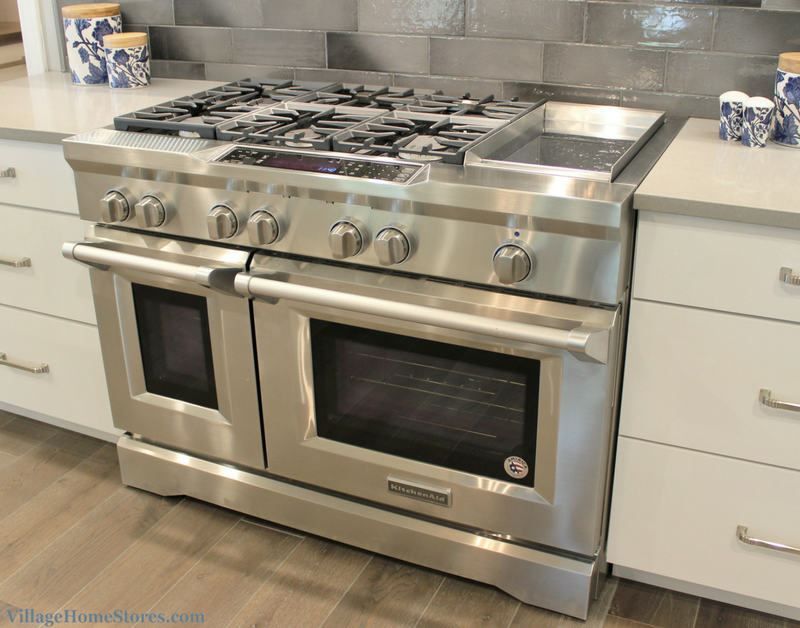 A Dual Fuel gas range means that you get the immediate control of heat in a gas cooktop plus the accuracy and consistency of an electric oven for baking. Cook more at once with two oven areas together totaling 6.3 cu. ft. capacity. 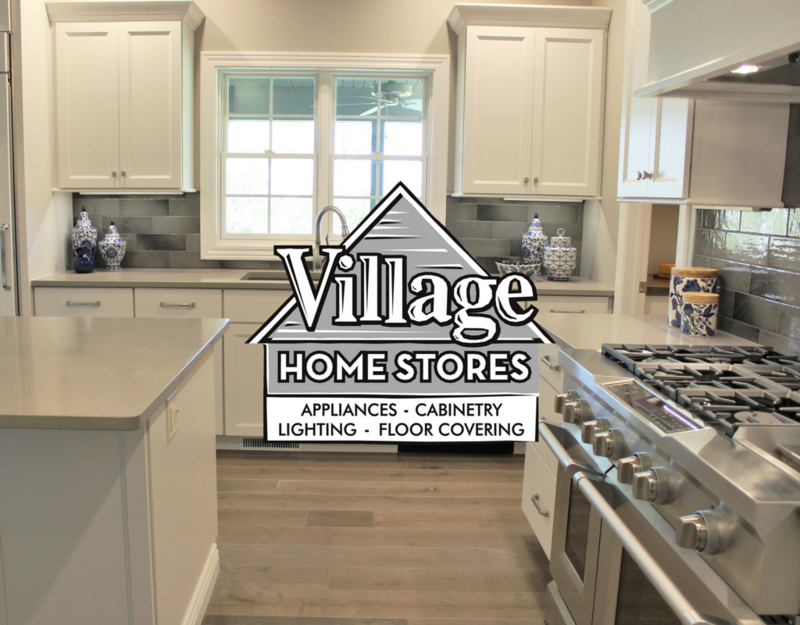 Engineered quartz countertops have been installed in a color named “Fossil Grey” with a standard “Eased” edge applied. 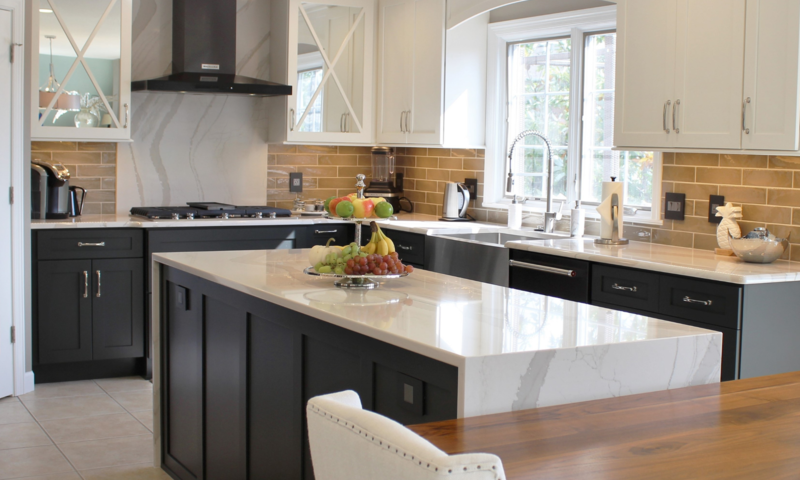 Quartz provides an durable, nonporous surface perfect for a busy kitchen ready for entertaining. 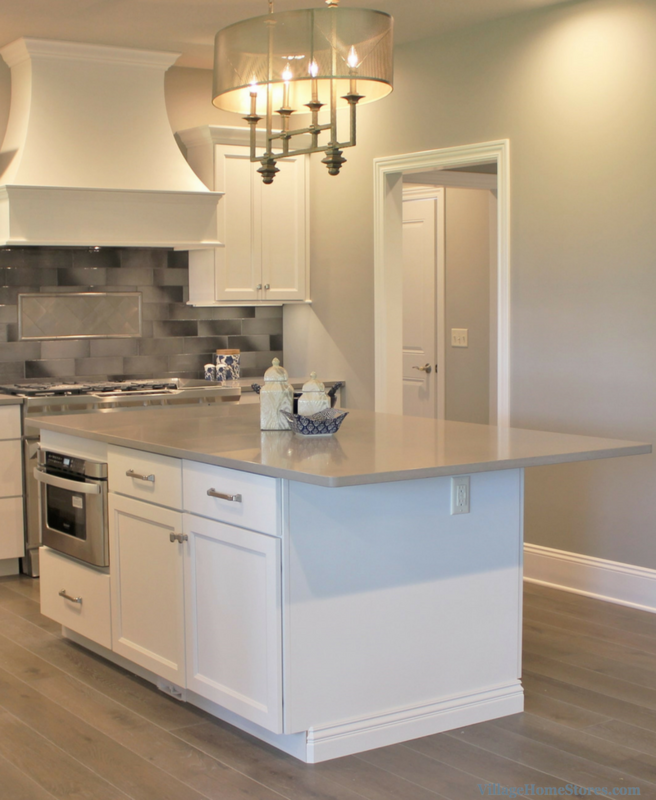 Selecting a subtle grey quartz for the counter is both classic and on-trend right now. 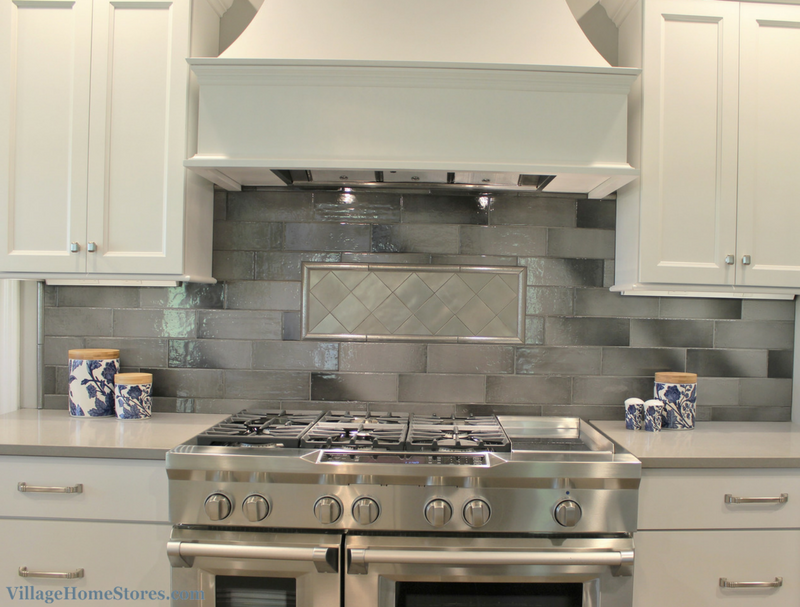 This quartz counter leaves the perfect base for adding a jaw-dropping tile backsplash in the kitchen. 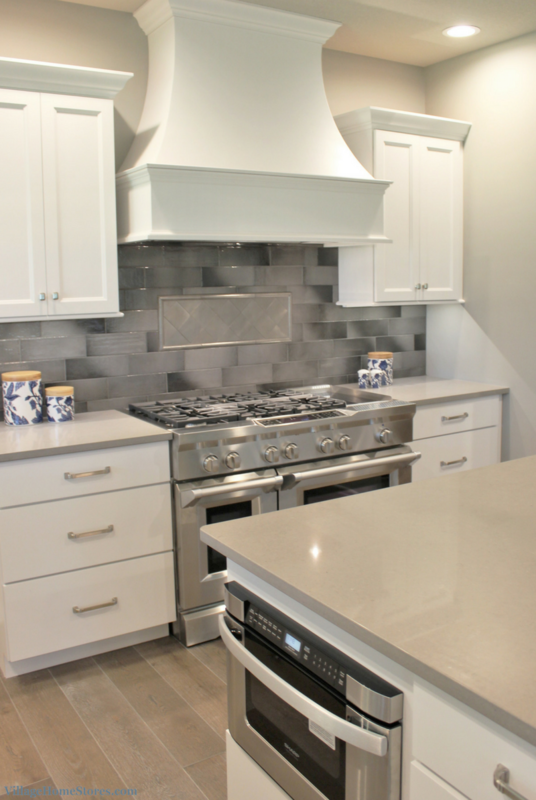 A 4″ x 12″ elongated gray tile from American Olean’s Stonepeak line is stunning! Available in both glossy (shown) and matte finishes, this “Auru” series can be used in so many styles of spaces! 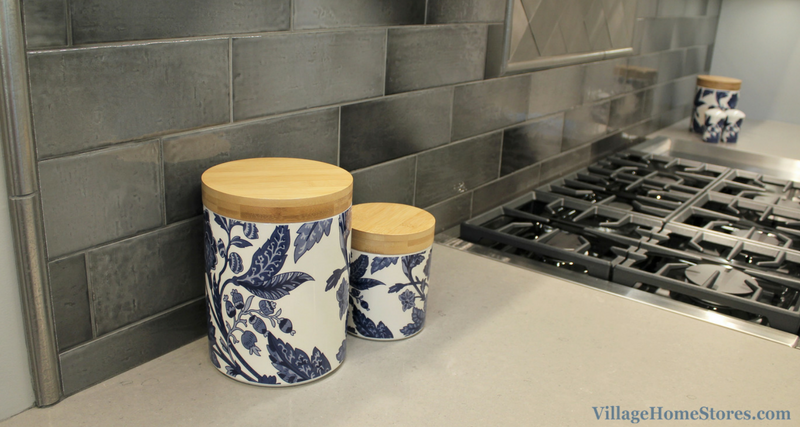 The “Slate” color here gives a trendy ombre detail but the pattern and surroundings ground it back to a Traditional style. The ceramic delft blue accessories paired with clean whites and the tiled walls give us bit of a wanderlust for a trip to the Greek Islands or a farmhouse in the South of France. The kitchen has an almost dreamy atmosphere from the light that hangs above the kitchen island. 4 candelabra lights filter through a metal screen shade and cast a unique shadow on the ceiling and surrounding wall cabinets. 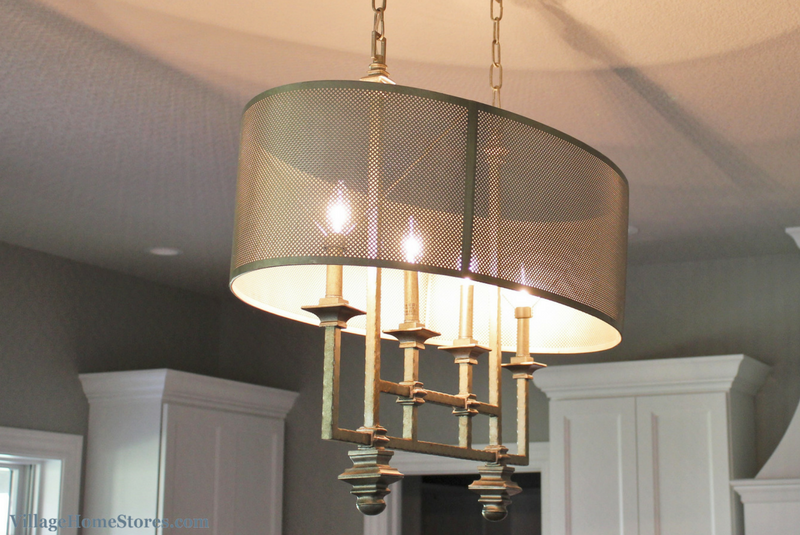 This light is from Savoy House, a new line we just added to the showroom. 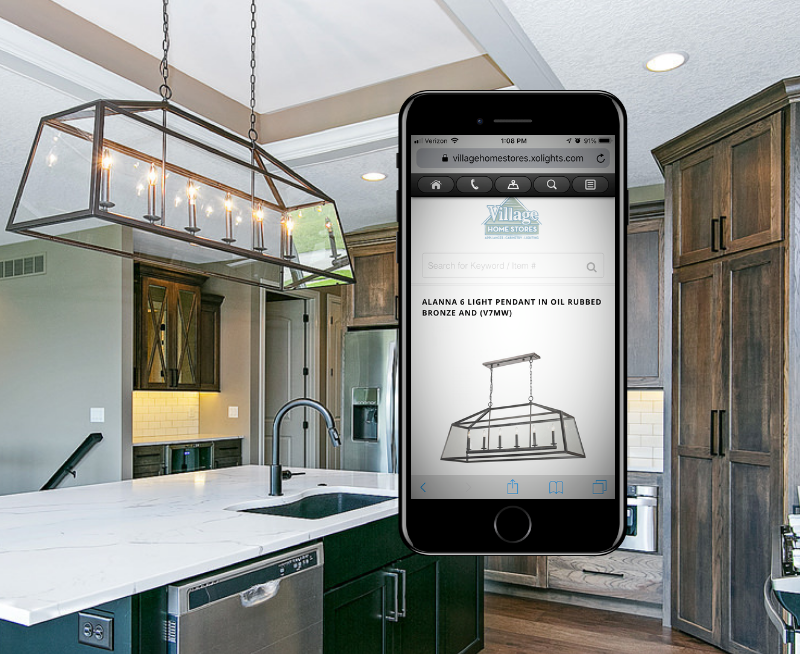 The fixture is named “Structure” and we just love it! We provided all of the lighting for this new home. 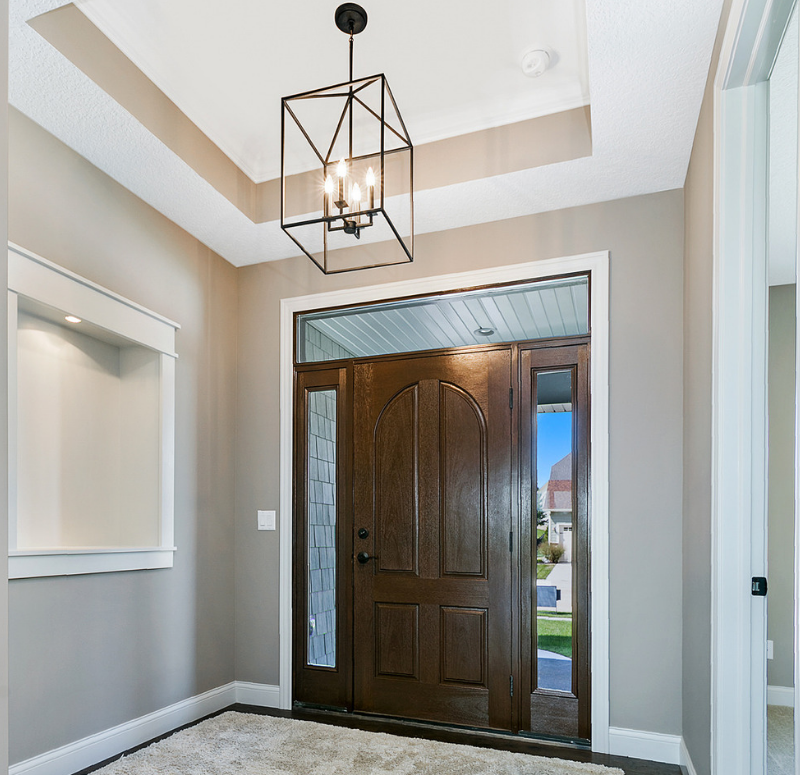 Our New Construction Lighting Expert helped select and budget with the builder to create a functional and stylish lighting package. The “Winton” 12-light chandelier from CraftMade Lighting pairs a weather wood look with dark bronze details. 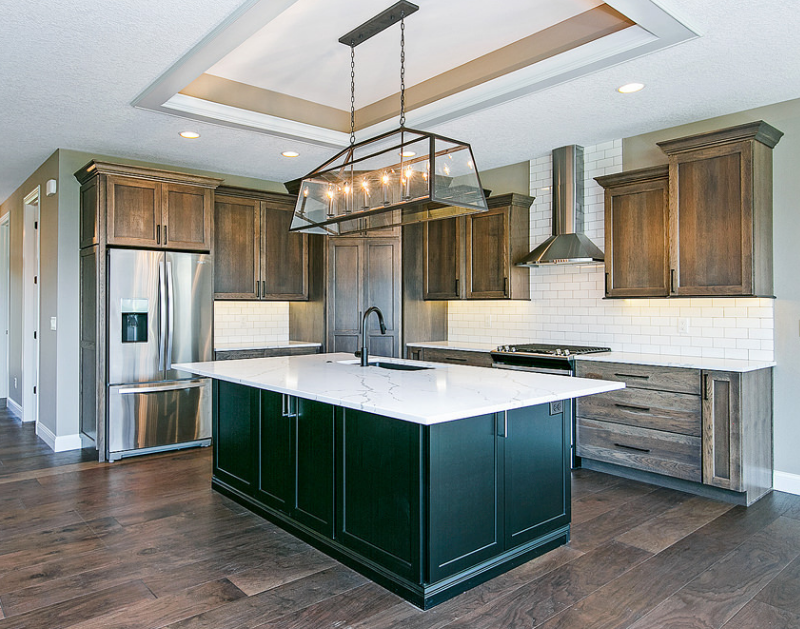 We didn’t just provide a beautiful kitchen design for this new Bettendorf, IA home. 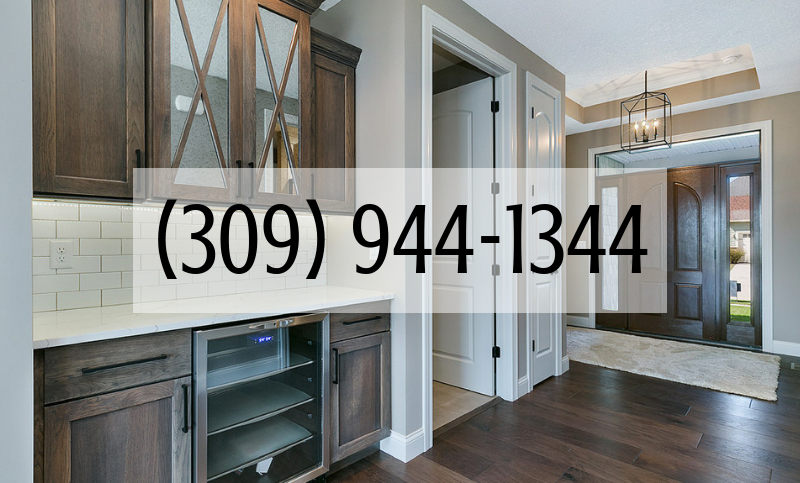 We also helped to complete the flooring surfaces, bathrooms, lighting, and even specialty areas like this builtin hutch in the hallway. 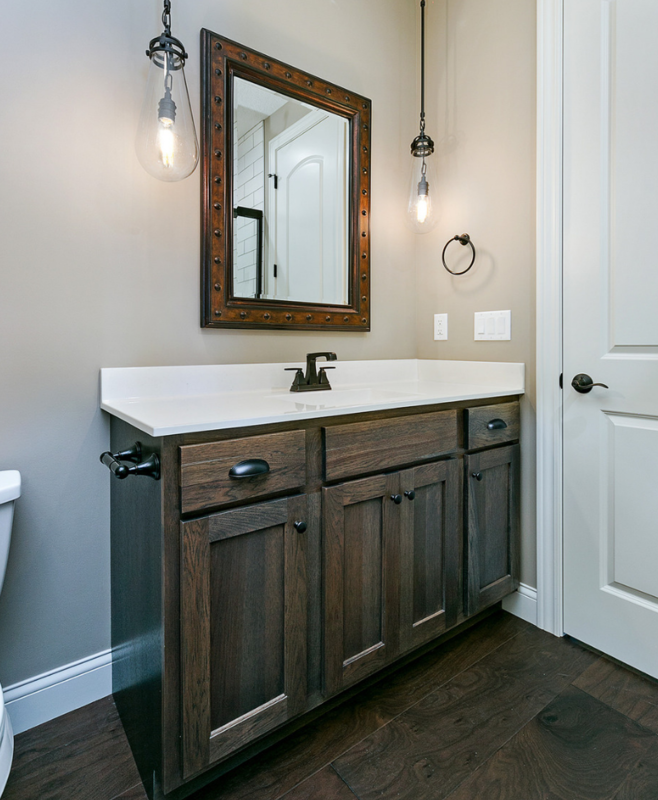 See the full album of photos including these other spaces here on our award-winning Houzz portfolio. The entire Great Room includes a Living room area, alcove sun room area, casual dining space, and the kitchen. This has been covered with an engineered hardwood from our Canoe Bay line. 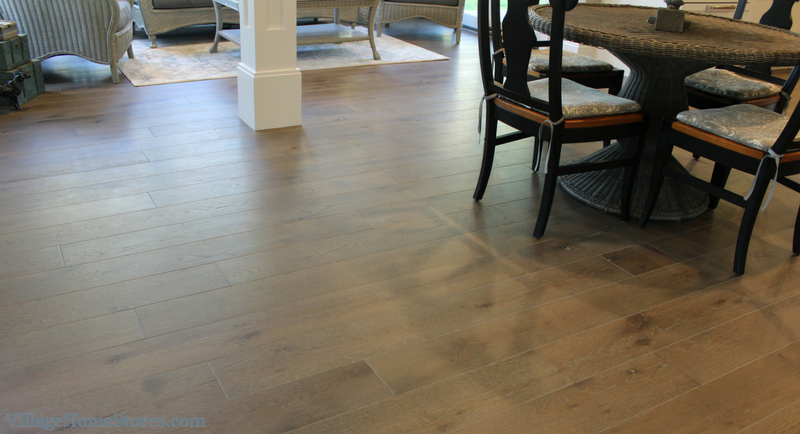 7″ wide planks from the Key West series are a White Oak in the “Lighthouse” finish. 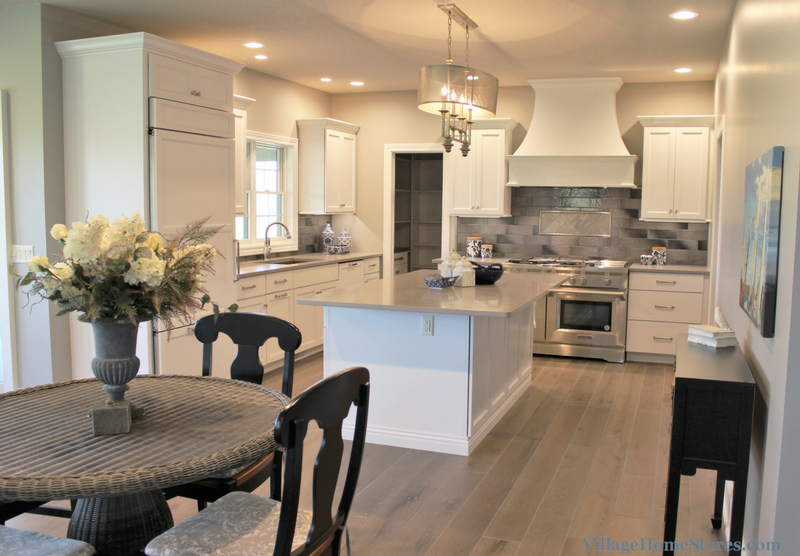 The white painted kitchen on the light oak floors are a dreamy pair!